Happy Kitchen Sink Stamps Monday, thanks for stopping by, I hope you had a great weekend! I don't know about you, but the time change had me really wanting to take a nap yesterday! I'm going to have to be sure to have my cards created early, so that I can take pictures while it's still light out, now that it gets dark around 5PM. I had assembled my background with the Basic Grey Papers and had something totally different in mind, but when I went to stamp the images I wanted to use to complete a sketch, they didn't work. So I pulled out a few other Kitchen Sink Stamps sets and ended up with this lovely holiday card. I like this, it's nostalgic (the images) and modern (the background) at the same time! Beautiful snapshot of Christmas with the branches and present framed out with the lovely paper! Lisa! Your present under the tree is just wonderful! I so LOVE the colors you used on the present, and the papers are just perfect! Hugs! Beautiful work with this cheerful package under the Christmas tree branches!! What a sensational holiday card, Lisa! Fabulous background with the wonderful jovial papers!! I am using them on most of my Christmas cards this year!! The gift box makes me want to pull the ribbon! 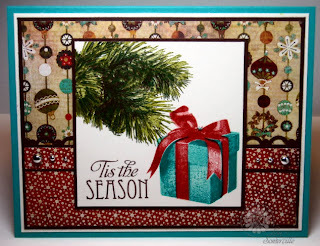 Beautiful card and I love that ornament background paper, which is so fitting for a present under the tree! Love this card! You really did a super pro job ob this card! Wow! It really looks as if the branch was real, and so is the gift! Wonderful! Gorgeous holiday card, love the colors on it-the teal in that paper makes me want to create with teal every time. Quite lovely & festive! I did take a nap yesterday.....! What a beautiful Christmas card! I love the colors you used for the present image! Pretty DPs too! You matched the gift colors to your DP perfectly. I love how it looks like it's tucked under the tree. Beautiful choices of DP too. Wow!